Appraiser Alasdair Nichol discovers the most valuable object ever appraised on the series: this 1937 oil painting by noted American Abstract Expressionist Clyfford Still. When "Antiques Roadshow" set up shop in Palm Springs, Calif. this spring, it uncovered its most valuable find in the series' history--an oil painting possibly worth $500,000. Thousands of people have lugged heirlooms, art, and old furniture to the PBS show's "Roadshow" exhibitions across the country and waited patiently in line to have an appraiser either surprise or disappoint with the opinion that what they treasured was a gem or junk. 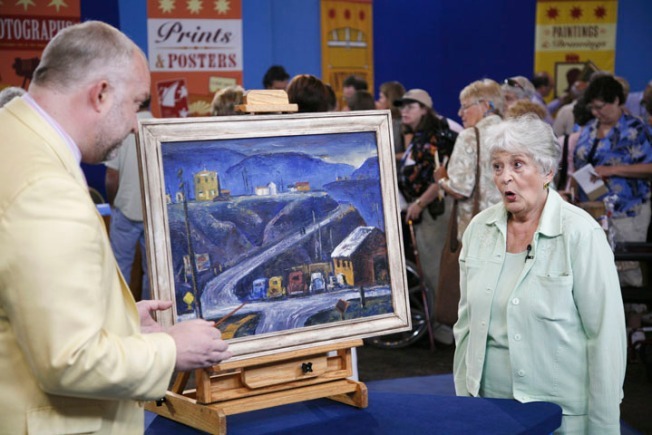 A woman brought an oil painting to a June taping of the show in Palms Springs, however, and was stunned to hear an appraiser deem a gift from a friend worth a fortune. The Clyfford Still painting was a present from her husband's friend, given as a housewarming gift half a century ago. Still later became a star of the 20th century post-war abstract expressionist school, and one of his pieces completed just a decade after the "Roadshow" item recently sold for $21 million, according to the New York Post. Appraiser, Alasdair Nichol, told the woman that he was actually conservative in his estimate.